Four strikes this week – the workers’ need your solidarity! This week in London there will be four different strikes taking place where workers leading the way urgently need your solidarity. 1. At the University of London, cleaners in the IWGB who were at the heart of the ‘3 Cosas’ strikes are set to be out this Friday, then Monday and Thursday. The strike involves the workers at the Garden Halls, which are due to close down on 30 June, placing over 80 people at risk of redundancy. The companies have refused to negotiate with the workers’ trade unions. 2. Workers at One Housing Group in Unite in London are set to strike from this Friday, 6 June, too. They’re out until Tuesday 10 June. The workers struck repeatedly against an attack on their pay last year. Now they are standing up to defend Bryan Kennedy, their lead convenor during the strike. Bryan was suspended in February, a result of union activities. They have held a number of protests and voted overwhelimgly to back him. Collections can be sent to Unite branch 1/1111 account no: 20040639 sort code 08-60-01. 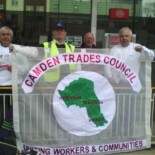 This entry was posted on June 3, 2014 by CAMDEN TRADES COUNCIL.